Conventional Buoy Mooring (CBM) or Multi Buoy Mooring (MBM) are offshore terminals operating in shallow water. CBM-MBM terminals are usually operated safely in areas where the wave height is less than 2 metres. The most common type of MBM terminal configuration is the CBM type. In a CBM configuration, the bow of the ship is held in position by its own anchors and the stern of the vessel is usually secured with mooring buoys. There are usually between 3 and 7 mooring buoys. Once the ship is moored, the crew will pick up the marker buoy and hoist the hose string and connect the tanker rail hose to the tanker manifold. CBM terminals are exposed to specific operational risks due to the offshore configuration of the terminals. • As the ship relies on its anchors to provide restraint to the bow, the ship anchors provide limited mooring capacity compared to permanent mooring legs. • CBM terminals normally have less redundancy in the design when compared to other berth configurations and a failure of a single mooring leg could lead to failures of nearby mooring legs due to the fact that the orientation of the tanker shifts and the loads are redistributed. Tanker breakouts can be caused by storms, sudden squalls, strong currents, variable tides, tankers mismanoeuvring or failure of deck equipment. The consequences of such incidents can be horrendous, with the possibility of massive pollution and damaged hose systems. Tanker and terminal downtime also add to potential problems. Following a tanker breakout and without the protection of an MBC, the close proximity of CBM systems to the shore means the clean-up operation can be a complex and lengthy process. Excessive and damaging pressure surge can be generated by the inadvertent closure of the export tanker manifold valve or the failure and slamming shut of the hose end butterfly valve (if fitted) during pumping operations. Generally a typical CBM hose string has a reinforced submarine hose at one end connected to the PLEM, several mainline submarine hoses, possibly a tapered submarine hose and then one or more submarine tail hoses and a rail hose. In the vast majority of CBM systems, the MBC is installed without floatation collars between the first and the second hoses off the PLEM. As the hose string is composed of 8, 10 or 12 hoses then should a tanker breakout occur, the load will be transmitted very early onto the MBC. This prevents damage to the hoses and PLEM and avoids a major pollution incident. In this position, the MBC is not subject to unnecessary bending moments during the lifting of the tail and rail hoses. If the CBM is composed of several hose strings then each hose string should be protected with an MBC suitable for the media transferred. Due to the specific characteristics of a CBM terminal, several key factors can influence the type of MBC to be installed. These factors also determine the MBC specification which includes the Design Parting Load and Valve Closure Speed settings. • PLEM: The design of the PLEM can influence the type of MBC. The PLEM also defines whether an MBC should have a standard Design Parting Load or whether a MBC with a reduced DPL can be supplied. If these options are not viable, then Gall Thomson may recommend the use of a Pressure Stabilised MBC with a very low Design Parting Load. 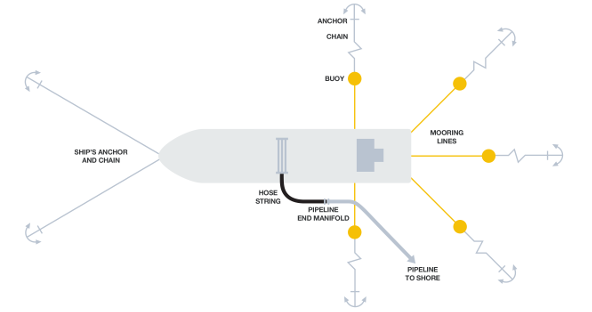 Most PLEMs have sufficient strength and the MBCs installed on the seabed can be set with the usual recommended Design Parting Load; however in certain cases, the pipeline may have to be either reinforced with concrete mating or the PLEM may have to be redesigned. In these cases, Gall Thomson will advise the most suitable option with the assistance of third parties. • Media transferred will influence the MBC valve type (typically a Flip-Flap Valve Type for refined products and a Petal Valve Type for heavy application). The media type will also influence the Valve closure speed. If the flow rate is extremely high (above 35 ft per second) then only a Petal Valve should be considered. • Flow rate will also influence the MBC type and the Valve closure speed. • Flushing procedure and the use of a pig will require the use of a piggeable MBC (Petal Valve MBC). • The hose string arrangement will have an influence on the size of the MBC and the type. 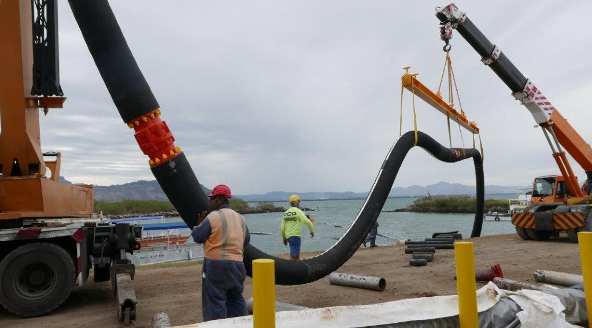 Gall Thomson can assist during the installation and commissioning of the terminal by providing an on-site technician. This will ensure the MBC is correctly positioned in the string and correctly handled. 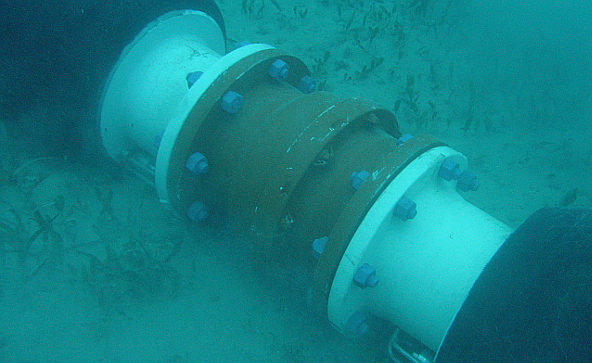 This CBM terminal in the Pacific, demonstrates the correct use of a spreader bar in supporting the hoses. By reviewing photos and videos of the submarine installation, Gall Thomson is able to provide an MBC condition assessment and recommend design upgrades such as Anodes, Petal Locking Mechanism, Lifting lugs, Valve Closure speed change and Design Parting load change. Shown below is a CBM system in East Africa. A tanker breakout occurred and the downstream half of the MBC together with the hoses are inspected. 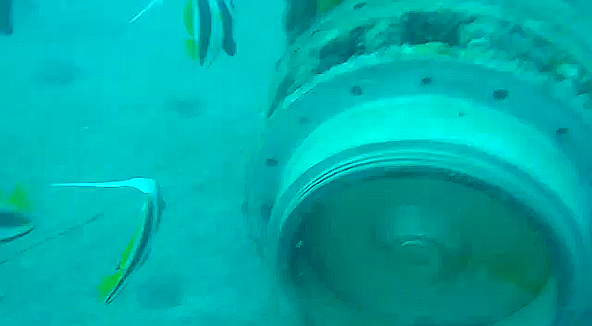 The diver carried out the inspection of the Upstream half of the MBC, the hoses and the PLEM. This is a 10” Flip-Flap MBC with Instantaneous Valve Closure. The Operator then had the MBC refurbished within the Gall Thomson MBC4 Service programme. For further information contact Gall Thomson.